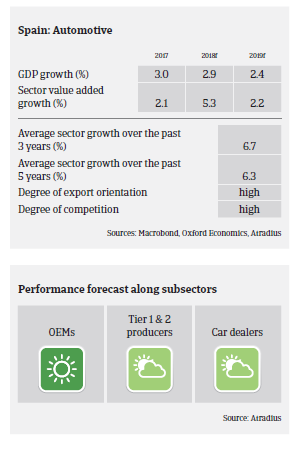 The Spanish automotive sector has benefitted from robust global demand over recent years. Domestic vehicle production recorded a cumulative growth rate of 45% from 2012 to 2016. In 2017 production decreased slightly (1.3% year-on-year) to about 2.8 million units, according to the International Organization of Motor Vehicle Manufacturers, OICA. The outlook for 2018 remains positive, with an expected output of more than 2.9 million units. Domestic car sales have recorded annual increases since 2012, in line with the rebound following the economic crisis. The improvement has been stimulated by robust private consumption a decreasing unemployment rate, increased access to bank financing for consumers and government schemes supporting the renewal of vehicle fleets and purchase of electric models. Domestic car sales increased 9.9% year-on-year in H1 of 2018. The profit margins of Spanish automotive businesses have been good over the past 12 months, and are expected to remain stable in 2018. While external financing requirements and gearing are generally high in this sector, banks are willing to provide credit to the industry, for both short-term financing (working capital management) and long-term facilities (i.e. capital expenditure financing). On average, payments in the Spanish automotive sector take around 60 days. Payment experience is good, and the level of protracted payments has not been overly high over the past couple of years. Non-payment notifications are low, and we do not expect major increases in the coming months due to the still positive outlook for automotive performance. The level of insolvencies in this sector is low, and this is expected to remain unchanged in 2018. Our underwriting stance remains generally open due to the low claims ratio, good payment behaviour and the industry’s strengths. However, in the Tier 2 producer segment we are more cautious with smaller businesses that are showing financial weaknesses (e.g. high leverage, low profit margins). Additionally, in the car dealer segment some businesses could face difficulties in selling their stock of diesel cars, while in larger cities the increase of car sharing initiatives is impacting sales. The immediate impact of potential US tariffs on cars and car parts would be limited, as the US is no key market for Spanish OEMs due to their model range (small and medium-sized cars), while most of the larger Tier 1 businesses have their own manufacturing plants in the US. The profit and loss accounts of businesses active in energy-intensive segments (e.g. cement) are negatively affected by elevated electricity and gas costs.